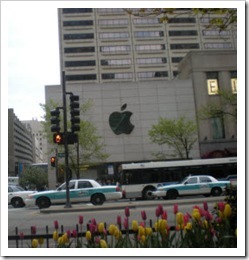 While in Chicago, I made a short trek to the Apple Store. 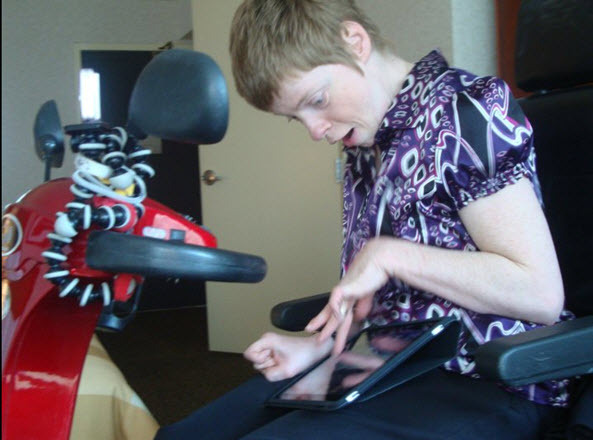 My mission was to try out an iPad, which are still unable here in Canada until May 28th, to see if I could reliably use the touch screen with my shaky athetoid cerebral palsy. The reason for wanting an iPad is to use it as a communication device while Iâ€™m out and about. Courtney spent a good hour with me, activating the device and then setting up an iTunes account to download the Prologuo2Go appp. I was impressed by the time she spent with me, as well as how she treated me. Thanks Courtney! In the end, I purchased the iPad 32G WiFi, iPad case and the protection plan (I usually donâ€™t buy them, but just in case) for $802.40 USD (including tax) and $215 in iTunes gift cards for the app (there was glitch with me being from Canada and purchasing gift cards to buy the app was the work around). In theory, I now had a communication device plus much more for $1,217.40 USD. Thatâ€™s what credit cards are for, right?! I left the Apple Store completely amazed by Courtneyâ€™s service, but not totally convinced I had made the right decision with purchasing the iPad. I then headed back to the the hotel where I was meeting my friends Karen and Amy, one of which is Deaf and the other is hearing impaired. I only had a brief time with my iPad before putting it to the test as a communication device. But, that was long enough! 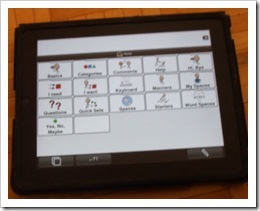 I discovered the Proloquo2Go app also has keyboard, as well as the predefined categories and phrases, which will take some learning and memories where specific words are. The neat thing is phrases can be added and customized, which may prove useful over time â€“ once I get to add them. But, the keyboard proved the most useful. When Iâ€™m communicating with people, they typically get stuck on a word or two. With the onscreen keyboard, I can type out the words â€“ like I did with the low-tech alphabet card but remembering what I had pointed to was tricky for some people. With the iPad, they can read what I had typed â€“ or I can have it â€œspeakâ€ the words, Although that was pointless for Karen and Amy who couldnâ€™t clearly hear the text-to-speech voice. Later that evening I attended the Social Media Club event. Again, the iPad proved useful for communicating. And, even later at the bar, hanging out with Ben Curnett, George Krueger and Mary-Lynn Foster and others. Mary-Lynn and I were having quite a conversation. Because of the iPadâ€™s back light and clear display, we had no trouble using or reading the iPad in the dimly lit bar. The font size in the Proloque2Go app was also large enough to read from a comfortable distance. The really cool thing was, because the Holiday Inn and bar had WiFi, I had internet access. When Mary-Lynn asked what I had been up to and I responded problogging and ghost writing, I was able to go to the dotgov blog to show her what I had written. I also showed her the video of me ziplining. The iPad allowed for another level of communication I would not have had with another communicator. Another night a group of us were at Mortonâ€™s Bar and Grill, making plans to go to karaoke, which turned out to be inaccessible but thatâ€™s another story. My friend Hope was having trouble figuring out what I was saying and she asked, â€œWhereâ€™s your iPad?â€ In that moment, I felt a sense of normalcy and acceptance. Using an iPad, which could become as commonplace as the Blackberry and iPhone, is not yet another thing that makes me different. I wasnâ€™t using a strange, unfamiliar device to communicate with this group. People were drawn to it because it was a â€œrecognizedâ€ or â€œknownâ€ piece of technology rather than being standoff-ish with an unknown communication device. I liked how as soon as I turned it on and slid the lock, the thing was ready to go. Thereâ€™s no need to wait for it to boot or for programs to start; the apps start immediately. Although there were a few times when the iPad appeared unresponsive, even when others tried it. I found restarting fixed that; perhaps thereâ€™s another trick when that happens that I have yet to discover. 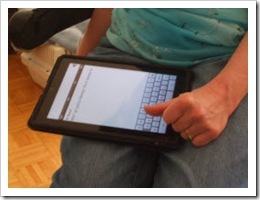 Initially I held that iPad in the landscaped position on my lap, giving me the largest size of keyboard. This way I was able to steady my hand against my abdomen and type with more than only my left thumb, which was a novel concept. And, at times, the screen would spin around and I would need to type upside down until I figured out to spin the screen back. A way to turn down the spinning sensitivity would be great. Typing accuracy wasnâ€™t perfect; I was discouraged and having second-thoughts about my purchase. But, a few days ago I realized my typing wasnâ€™t perfect on my old Smith Corona typewriter with keyboard or on my various computer keyboards, erasing my doubts about my purchase decision. While killing six hours at the Oâ€™Hare airport, I discovered that holding the iPad in the portrait position yet sideways on my lap with the small-sized keyboard parallel with my thigh, I could guide my hand along my thigh and type with my left thumb. My typing speed and accuracy was surprising; Iâ€™m curious to test if my typing speed is any faster on the iPad â€“ thatâ€™s another post. Although I do envision myself sitting out on the deck, on the couch or comfy in bed, writing. Then, I did something I had never done before: I went into one of the many Starbucks at Oâ€™Hare and ordered my first mocha frappuccino by myself. No misunderstanding or hand gesturing involved. It was so cool, like another door had just opened for me! I feel like technology is finally catching up with what I truly need. This post brought tears of joy to my eyes, Glenda. Thank you for it. Technology can be an amazing thing, bringing people together — if we use it carefully. It can also be a force for separation and negativity. So beautiful to see its usefulness to you and other people with different abilities. Wanted to let you know I found you via Chris Broganâ€™s recent webinar — he used the title of an old blog post of his from Sept 3, 2008 and you were featured. It was from when he met you at Blogworld. I wanted to read more about you so found his whole blog post and then your blog from there. Iâ€™ll be reading your blog, I love your writing style! You can either switch the portrait lock on the side of the iPad (this may have been replaced by a mute switch), otherwise hit the home button twice, swipe left until you see the iPod controls (play, pause etc.) and press the portrait/landcape lock button. You can lock the screen in portrait by using the orientation lock switch, which I don’t remember exactly where it is, as I don’t have an iPad myself, but it is a physical switch on the unit. Warning: Apple was talking about turning it into a mute switch, I believe, but if they do or have done that already, when 4.2 comes out later this month you can just double tap on the home button and swipe I think left to access the orientation lock. I don’t remember if it is one or two swipes though. This is assuming that 4.2 will be the same as 4.1 for iPod Touch. I so enjoyed reading your blog. I have been trying to get one for our non-vebal learning disordered, and autism spectrum disorder, 13 year old daughter. She does not like to talk to almost anyone. Except for her dad and I. And sometmes that is hard for her to do. She talks some at school, but not much. And at church she has hardly said a peep to people. And at family get togheters, nothing there either. This would so help her so much in her social activity. This sounds like it would be awesome for her to have. Than she could communicate, with everyone she knows. I’m hoping it would also help her with her reading and writing too. Good luck, and thank you for the nicely writen artcle. And good luck in all that you do.